Strv fm/22 (m/21), no 10. > Notes and corresponding documents from the Swedish Military Archives. We are several active researchers within SPHF (The Swedish Armour Historical Association) that for many years now have been frustrated when “our story” about the purchase of LK-II / strv fm/22 (m/21) tanks from Germany hasn’t been accepted by foreign historians and “insiders/besserwissers “. Therefore, we decided to present it again, backed up by throughout research and documents from the Swedish War Archives (KrA). Original documents and photos from KrA now clearly verifies the purchase and production process. We would like to take this opportunity to extend our thanks to Rickard Lindström who copied the documents at KrA. We use the designation “fm/22 (m/21)” [fm = försöksmodell = English: trail version, and m = modell = English: version] since the vehicles were initially named pansarvagn fm/22 [English: armoured vehicle trail version 22], which later changed to tank m/21. There are basically two myths that flourish without historical documentation or other trustworthy evidence. b) if Joseph Vollmer had been in Sweden and managed the work with the tanks here, the army leadership should have mentioned this with pride. Such references can not be found. c) at this time in 1922, Vollmer was probably fully busy at Skoda in Czechoslovakia constructing his wheel/track tanks KH 50 (Kolo-Housenka 50), 1923-25, the KH 60 in 1928 and KH 70 in 1930.
d) furthermore, it is proven (see below and Appendix K1) that the design work was led by the engineer Steger from the company Wilhelm Ugè in Berlin. The second myth is that AB Landsverk would have manufactured the LK II tanks (strv m/21 tanks). That’s wrong. A mechanical workshop started in Landskrona in 1872. It changed its name a few times, but from 1877 until 1925 it was called Landskrona Mekanisk Verkstad (Landskrona Mechanical Workshop). Agricultural equipment, stoves, ovens, ordinary commercial castings as well as railway wagons and railway bridges were produced. In 1920 German capital through the Gutehoffnungshütte Group, Aktienverein für Bergbau und Hüttenbetrieb, GHH, bought 50% of the company. In 1925, the part was increased to 61%, while at the same time renaming the company to AB Landsverk. Not until 1928 did AB Landsverket have a drawing and construction office for the design of armoured vehicles, tracked vehicles and tanks. Landsverk’s first military product was the chassis for the armoured car pansarbil fm/29 (1929) followed by the armoured car pansarbil fm/30 (1930 prototype for armoured car pansarbil m/31) as well as an armoured motorcycle, all to be used by the Swedish cavalry. AB Landsverk had links to German armour, although not as extensive as many people claim. This in itself, is the basis for a separate article. But in short, it is worth mentioning that the myth that AB Landsverk tested armoured vehicles at Panzerschule Kama in Kazan, at that time the Soviet Union, also rests on a misunderstanding. GHH in Oberhausen probably tested an early version of the GKF or the M28, an early wheel/track tank, in Kama. Five or six different versions were built during the development of the vehicle. This vehicle later came to be called L-5 by AB Landsverk. Bofors (Krupp) bought a number of turrets from AB Landsverk, which armed three Krupp’s Leichter tractors, also tested in Kama in 1930. Two Swedish officers, Captain Gillner and Captain Bratt visited Maschinenfabrik Esslingen in Germany, part of the GHH Group, also a partner to AB Landsverks, from the 2nd to the 6th December 1930. The officers studied the L-5 chassis, drawings and test drove the vehicle. The Group’s Chief Engineer, Diploma Engineer Otto Merker, was all the time at the Swedish officers’ disposal. In January 1931, the same officers visited Fried. Krupp AG in Essen, Bofors’ partner, studied their test vehicles, which they were not equally fond of. 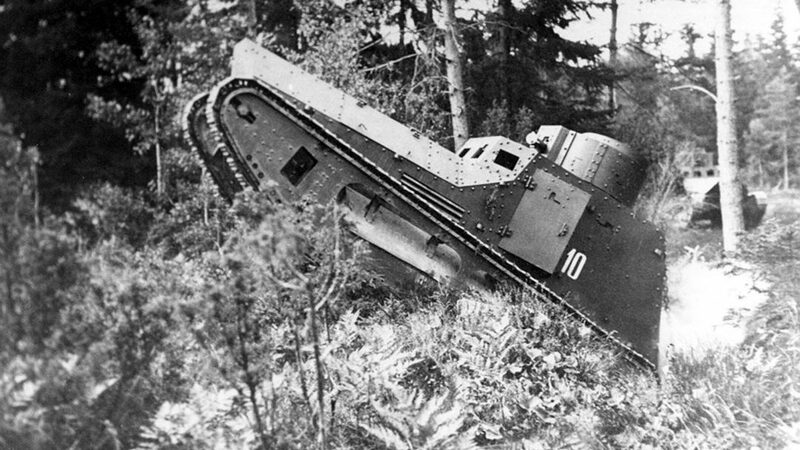 Sweden ordered three L-10 tanks and a wheel/track tank L-30, a further development of L-5, provided that Otto Merker led the work of the tanks at AB Landsverk in Landskrona. He arrived in Landskrona 1931 – 1939 (? ), after which he returned to Germany, where he worked in the engineering industry and subsequently built submarines. 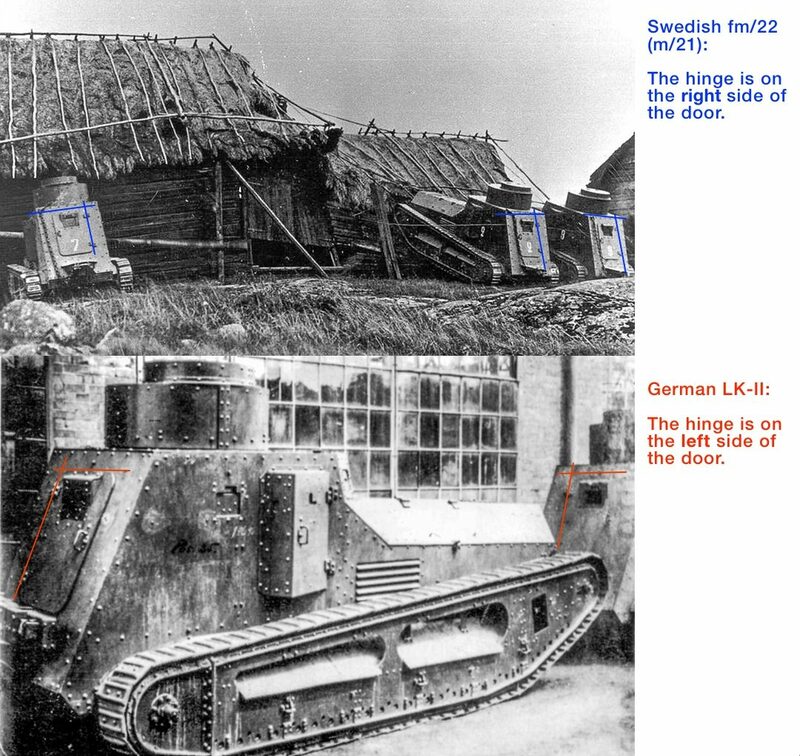 With the reasoning below, supported by the historical original documents, we consider that once and for all, we have determined how the Swedish Armoured Corps was born. This is beyond doubt, the correct initial development so other myths and fabrications can thus be added to the story as just what they are, namely something that could have been, but never really happened. There are also further details to complement the below with, which we intend to do within the ongoing research. Reign December 12, 1907 – October 29, 1950. Kungl. Armeförvaltningens Artilleridepartementet. (KAAD) [Royal Army Artillery Department]. Head: General feldzeugmeister and Inspector of Artillery: Major General, Baron Ulf Lars Carlsson Sparre. 1. Department: Handgun and its ammunition. and 2. Department: Artillery materiel. Head: Captain Carl Birger Reinold. Schenström. Motorization Expert in Artillery: Captain Walter Elliot, A9. 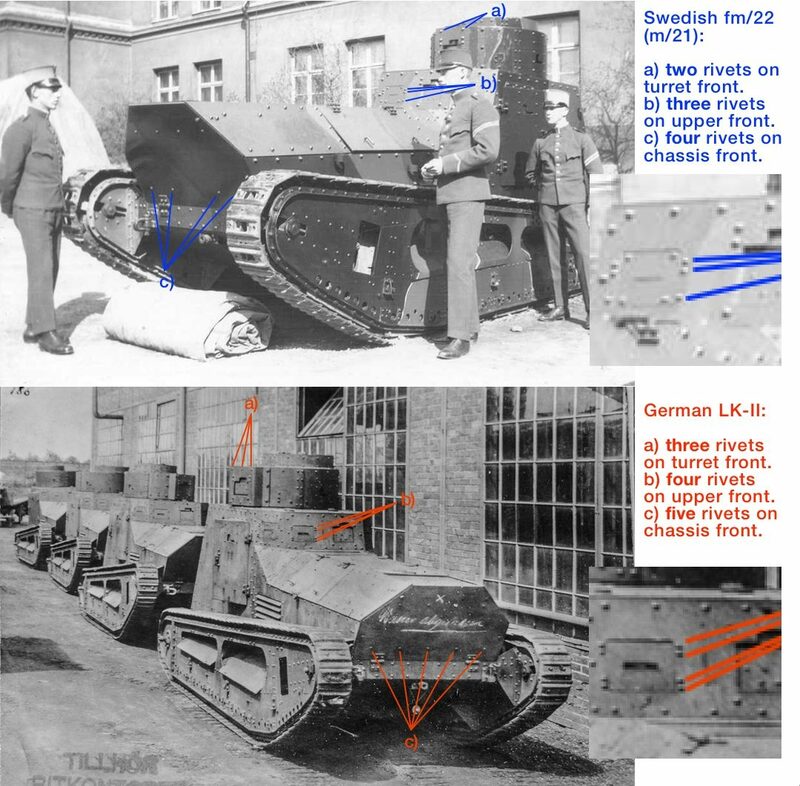 Below is a summary of notes and a selection of documents in chronological order about the Swedish purchases of LK II chassis, as well as steel sheets for armoured in the years 1920 – 1922, which reinforce “our history description” and at the same time clearly punctuate the existing myths above. In April 1920 his Royal Majesty approves eight experts to be assigned to the Head of General Staff disposal, to “examine proposals for the introduction of new infantry materials come for the first time used during the WW 1.” “The Infantry Committee” as it was called, would examine machine guns, mortars, infantry guns, anti-aircraft guns, various new grenade types, as well as tanks, to investigate if they could be introduced to strengthen our defense. Pretty soon this Committee’s work resulted in a parliamentary bill, specifically: January 7, 1921, ”Proposition med förslag till tilläggsstat till riksstaten för år 1921”. In paragraph 32 of this bill, the Parliament granted January 11, 1921, a grant of 1,651,900 SEK for experiments with so-called “technical aids”. In January 1921 the Commanding Officer of the Kungl. Arméförvaltningens Artilleridepartement (KAAD) (Artillery Department of the Army Administration) baron U. Lars C. Sparre sends a letter (1) to the military attaché in Berlin, Major H.P. Låftman asking him to probe the possibility to buy various German weapons, including German tanks. In February 1921 Captain Reinold Schenström, Commanding Officer at the Engineering office – KAAD, wrote (3) to Steffen & Heyman and requested quotes for miscellaneous equipment, among others on a tank. Steffen & Heyman didn’t respond (3A) until July 15, when they offered a “Raupenschlepper”: Chassis: Brand new, weighs 5.5 tons. The motor is an Opel 25/55 Hp Price: 261,000 RM. With 9mm armor weight about 4.5 tons Price: 184,000 RM and intended to be armed with 2 machine guns. The price of the complete tank was 445,000 RM. (Appendix: C1-C5) Steffen & Heyman told that the same unit was quoted for Yugoslavia and that they had a total of 15 units for sale. CB’s comment: Together with the offer letter C1–C2 from Steffen & Heyman, three photos were also sent – C3 = 1 photo of 4 LK II in a row outside of their factory, which was stamped ”tillhör ritkontoret” when they arrived in Sweden (see above) and C4 = an LK II from the side (these two photos have circulated in discussions before, without knowing where they came from) and a photo C5 from the S & H assembly hall. Closest to the camera two Raupenschlepper being assembled can be seen as well as further into the assembly hall a LK II. and an LK II in the hallway. Here the larger radiator can be see being installed. See also B7. The fact that an extra large cooler is mounted is not strange, as the Raupenschleppern becomes extremely heavily loaded. First with armour 4.5 tons, 2 machine guns, ammunition, machine gun accessories, 4 men crew and tool for the Raupenschlepper. Comparing the pictures that came with the offer letter from Steffen & Heyman with pictures of the Swedish fm/22 (m/21) you can clearly see the difference in details on both the front as well as the back side. 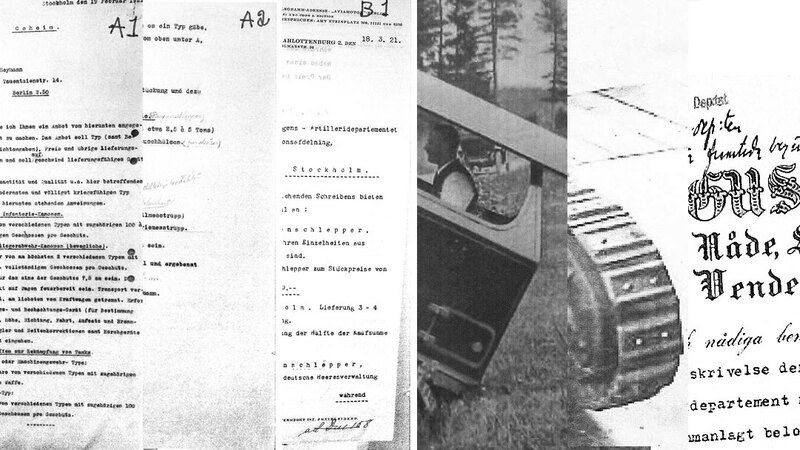 It is therefore impossible that the vehicles offered by Steffen & Heyman later become Swedish strv fm/22 (m/21). At this point, it was no longer interesting to buy from this company, since the same type of units had been offered cheaper from another company, Wilhelm Ugé Gmbh, Hacker Strasse 5, Berlin-Friedenau. In a letter (4) from Major Låftman in Berlin to the Commander of the Military Office, KAAD, Feldzeugmeister Osterman, it is mentioned that they have found a new seller (Wilhelm Ugé Gmbh) with ten armoured vehicles for sale in Germany. CB’s comment: This means that Major Låftman found a total of 25 LK II, complete or in parts. Major Låftman is asked by the Military Office KAAD to reserve about five units at Wilhelm Ugé Gmbh for the 100 000 SEK already granted. The Military Office, KAAD, announces that it wants an option on the remaining units since they’re seeking additional funding. On July 1, 1921, an additional 100 000 SEK in funding was granted for the purchase of armored vehicles from Germany (5). On July 11, 1921, a telegram is sent to the military attaché in Berlin (at that moment Captain Ferrell) from the Artillery Department regarding that no response had been obtained (7). Captain Schenström and Captain CW Elliot receive compensation for travel expenses for the trip to Germany to inspect ten tanks (8). (Appendix: E1). Captain Schenström and Captain Elliot travel to Germany for inspection. CB’s comment: Notice, that despite the fact that the manager of KAAD’s construction department Captain Schenström, and Captain Walter Elliot inspect the vehicles Walter Elliot signs the contract as an individual. The Swedish state/army is not mentioned in connection with the purchase. The shipment is declared at customs as agricultural tractors and steam engine sheet metal. Correspondence concerning partial delivery. On September 21, 1921, writes Captain Schenström to Major Låftman that only five Raupenschlepper has arrived in Stockholm (12). However, the foreman arrived but he should be sent back until the complete material has arrived (13). On September 27, 1921, announces major Låftman that the remaining five Raupenschlepper are loaded and shipped (14). Notes in the above letter show the following summary of payments (15). On January 7, 1922, announces Captain Schenström to Major Låftman that approximately 10 tons of sheet metal parts arrived from Lübeck, but not yet parts for a complete unit (15). Correspondence between Major Låftman and Captain Schenström regarding partial delivery. On January 7, 1922, mentions Major Låftman that some boxes of small parts to Raupenschlepper are still with him (18). On January 14, 1921, mentions Captain Schenström that in Sweden bolts for mounting of tanks has been purchased (19) and March 18 mentions Captain Schenström in a letter (20) to Major Låftman that installation work on the armoured vehicles has progressed quite far, but still some parts from Germany are missing. On April 3, 1922, the head of KAAD asks the commander of the Naval Shipyard that the assembly of nine tanks shall be made at the Naval Shipyard (22). The request shows that a unit is already assembled and should serve as a model. The armour is uncured and needs to be cut prior to assembly. On June 1, 1922 a one-sided instruction arrives for the operation of Raupenschlepper from Wilhelm Ugé Gmbh (24). On June 3, 1922, Captain Schenström writes to Major Låftman, that the assembly work on the remaining units are underway and should be completed in July (25). The armour must then be cured and Captain Schenström would, therefore, receive information about how this shall be done from Wilhelm Ugé Gmbh. On June 21, 1922, Wilhelm Ugé Gmbh sends a quote for internal starting equipment (26). On June 22, 1922, spare parts for tanks for 198,000 RM are purchased from Wilhelm Ugé Gmbh (27). Captain Schenström mentions that he has ordered the parts from Wilhelm Ugé Gmbh and that they will be sent by boat from Lübeck. On 25 June 1922, parts arrive in Sweden (28). On July 10, 1922, Captain Schenström announces that spare parts will be sent by steamer Frode to Stockholm (29). On August 7, 1922, Gevärsfaktoriet i Eskilstuna are asked to make curing tests on armour plates for tanks (30). On August 14, 1922, a sample of cured armour sheet shall be returned to Stockholm for test firing (30). On November 6, 1922, Captain Schenström mentions that the armour for the tanks is uncured but the steel quality is suitable for curing (32). Notes and corresponding documents from the Swedish Military Archives. 1/ KAAD. Fälttygmästaren. Serie E I:17. Inkommande handlingar 1921 – Dnr H 55. 2/ KAAD. Fälttygmästaren. Utgående handlingar 1921. Dnr 158 M1. 2a/ Svarsbrev från Steffen & Heymann18 mars 1921 inkluderande fem bilder. 3/ KAAD, Konstruktionsavd. Korrespondens 1919 – 1930. F I:4. 3a/ KAAD, Konstruktionsavd. Korrespondens 1919 – 1930. F I:1. 7/ KAAD. Telegram till Kn Ferrell. Militärattaché i Berlin. 12-16/ KAAD.Konstruktionsavd. Korrespondens 1919 – 1930.F I: 1. 18/ KAAD, Konstruktionsavd. Korrespondens 1919 – 1930. A-E F I:1. 19/ KAAD, Konstruktionsavd. Korrespondens 1919 – 1930. L-Ö F I:4. 20/ KAAD, Konstruktionsavd. Korrespondens 1919 – 1930. A-E F I:1. 21/ KAAD. Fälttygmästaren. Inkommande handlingar 1922 EI:18 Dnr H 51. 22/ KAAD, Konstruktionsavd. Korrespondens 1919 – 1930. L-Ö F I:4. 23/ KAAD, Konstruktionsavd. Korrespondens 1919 – 1930. A-E F I:1. 24/ KAAD, Konstruktionsavd. Korrespondens 1919 – 1930. L-Ö F I:4. 25/ KAAD, Konstruktionsavd. Korrespondens 1919 – 1930. A-E F I:1. 26/ KAAD, Konstruktionsavd. Korrespondens 1919 – 1930. L-Ö F I:4. 27/ KAAD, Konstruktionsavd. Korrespondens 1919 – 1930. A-E F I:1. 28/ KAAD. Fälttygmästaren. Inkommande handlingar 1922 EI:18 Dnr H 64. 29/ KAAD, Konstruktionsavd. Korrespondens 1919 – 1930. A-E F I:1. 30/ KAAD, Konstruktionsavd. Korrespondens 1919 – 1930. F-K F I:3. 31/ KAAD, Konstruktionsavd. Korrespondens 1919 – 1930. A-E F I:1. 32/ KAAD. Fälttygmästaren. Inkommande handlingar 1922 EI:18 Dnr H 51. 33/ KAAD, Konstruktionsavd. Korrespondens 1919 – 1930. A-E F I:1. Comparison of front side between German LK-II and Swedish fm/22 (m/21). Comparison of back side between German LK-II and Swedish fm/22 (m/21).